We Service the south Florida Tri County area. D Best Locksmith has been servicing the south Florida Area for over ten years. 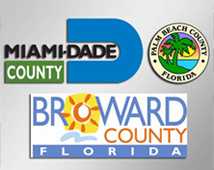 We service all of Broward County, Dade County and Palm Beach County. We are open 24/7 seven days a week providing professional locksmith and security services. Give us a call today or book and appointment. D Best Locksmith will always provide the best locksmith services around the south florida area. We strive to meet all our clients expectations by providing quick and reliable service. If your in an emergency we will send our qualified locksmith technician to you right away. D Best Locksmith provides many services in the locksmith and security indusrty let us service you today!